For our research we first needed crabs. 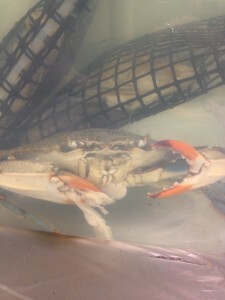 Kelly purchased a set of crabs that we worked with, however, these crabs were unfit. They demonstrated unusual behavior, died off quickly, and ultimately we had to throw that set of information out. So, we went crabbing for the second batch of crabs at Packery Channel. We first prepared the bait which consists of string tied to a ruler and chicken at the other end. We set up tanks which consist of filters and shells. We also had incubators to hold the crabs when crabbing. During a a full day of crabbing we successfully caught many crabs that met our needs (about 2 inches). We next separated the crabs in to groups: Control group which received no pesticide, exposed group which received doses of pesticide, and an acute group which received a small dose of pesticide. Throughout the process we had to continually maintain healthy crabs by proper care. Tanks had to be cleaned, filters needed to continually be checked and cleaned, and the right type of water needed to be used. We learned that the pesticide does affect the behavior of crabs. The crabs exposed had reduced natural crab characteristics. Since a lot of my time was with the first batch of crabs (where the research was non reliable) I learned the difference between a healthy and ill crab. Healthy crabs are quick to flip back, active, and are quick to pinch at whatever threat nears them. On the contrary, ill crabs are slow moving. not affected as quickly by danger, and are slow to retract their eyes. Would crabs eventually develop a resistance to the pesticide if their environment continues to carry it for a long period of time? Does the stress of being in small tanks affect their behavior instead of just the pesticide? (G) construct appropriate simple graphs, tables, maps, and charts using technology, including computers, to organize, examine, and evaluate information.